Oh, look! It’s another holiday photo. I know, I know. You thought I was done for the season ― so did I ― but then I found this photo. I took it two years ago almost to the day when I was exploring Key West, Florida. I liked the incongruity of the various bits of greenery in this shot. Oh, look! It’s another mural. This one is in Sarasota, Florida. I think it’s obvious why I like it. Speaking of migrating birds, most of the Canadian snow birds have flown south and are nicely settled in their warm(er) locales. I won’t be enjoying a tropical break this winter, but I can still dream about lying on a beach. I took this photo last winter on the Atlantic side of the Florida Keys. One advantage of being in South Beach on a rainy day, I was pleased to discover, is that the wet made for some nice reflections when the lights came on after dark. Here, again, are a few of the many, many photos I took during my one evening in South Beach. Editing these photos made me realize I should make more of an effort to do night photography in Vancouver. Since, you know, we do get a lot of the wet stuff here. Living in a beach town, as I do, I’m always keen to check out other beach towns. Some remind me of Vancouver (sort of ― that would be Cape Town), some don’t make me think of Vancouver at all (that would be Barcelona), and some make me think I could still be in Vancouver (almost ― Waikiki, I’m talking ’bout you). South Beach is in a category all its own. Separated from the city of Miami by Biscayne Bay, it’s located on a series of barrier islands that front the Atlantic Ocean. The beach itself is massive ― unfortunately for me, the one day I had to spend in South Beach was stormy and windy, scuttling my plans to spend my last afternoon in Florida lying on the beach. No matter. I had a second reason for visiting South Beach: its architecture. South Beach was developed quickly during the 1920s and ’30s and many of its buildings were built in a similar style. 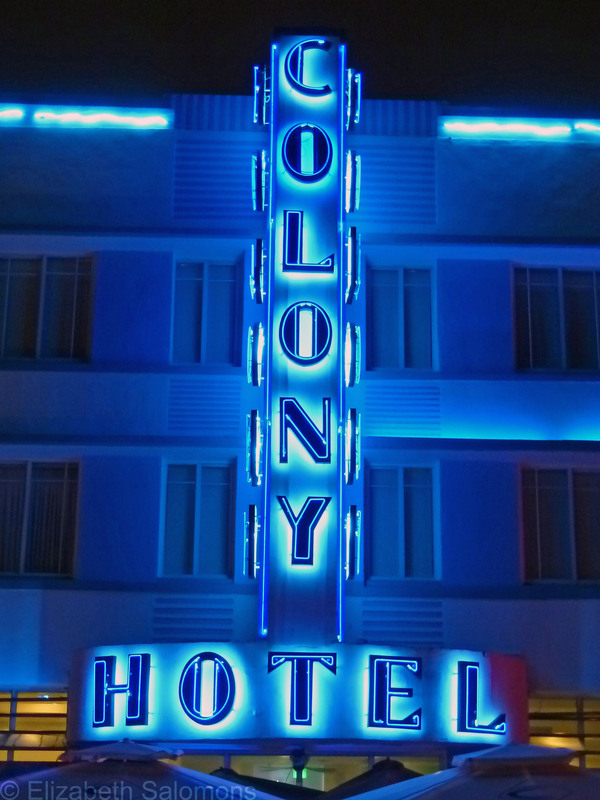 As a result, South Beach has one of the finest collections of Art Deco and Streamline Moderne buildings, with more than 900 of them considered to be of historical significance. The Miami Art Deco District was added to the list of U.S. historic districts in 1979, but many credit the 1980s TV show Miami Vice with providing the incentive to clean up what had become a run-down and crime-ridden neighbourhood. If you are a regular reader of this blog, you might have figured this out about me: give me a subject to photograph and I’m content, no matter the weather. And so, as it turned out, I had a great time exploring South Beach in the wind and the rain. Here are a handful of the more than 100 photos I took that day. Once upon a time, a Canadian twentysomething was registering for her senior year at a small liberal arts college somewhere in the American Midwest. Her timetable was jam-packed as she tried to squeeze in all the required courses she needed in order to graduate. When her advisor told her she had to fit in at least one American literature course (“you are not going to graduate with an English major from an American college without studying American literature!”), she was annoyed. Reluctantly, she registered for the course. When she showed up to class, she discovered that the prof was a bore, the reading list a snore, and, to add insult to injury, every Friday afternoon she and her classmates were subjected to a reading quiz. A reading quiz?? What was this? High school?? In protest, the college student didn’t read any of the assigned novels. She managed to pass the course, albeit with the lowest grade of her academic career. The summer following her college graduation, this college student (now college grad) picked up the unread American novels she had lugged back home to Canada. Since she was intentionally unemployed (as she called it), she had lots of time to read. So she read them all. And that is how one Canadian college grad discovered Ernest Hemingway. Hemingway!! Who knew? For many years afterwards, she fervently declared to anyone who asked that For Whom the Bell Tolls was one of the best novels she had ever read. She was chuffed when a writing teacher once praised her work as being “just like Hemingway’s!” (She didn’t believe him, but she was chuffed.) And when the college grad (now editor and writer) found herself many years later on holiday in Key West, she made a beeline for the Hemingway Home and Museum. Ernest Hemingway lived on and off in Key West from 1928 until 1940 with wife # 2 (Pauline Pfeiffer). They bought the 3000-square-foot house in 1931; it was, and is, the largest residential property in Key West. In 1937, after Hemingway took off for Spain to report on the Spanish Civil War with the woman who would become wife # 3 (Martha Gellhorn), Pauline built a swimming pool over his beloved boxing ring. After the divorce, Pauline continued to live in the Key West house with their two sons until her death in 1951. The Hemingway Home and Museum opened in 1964. For the past 50 years, knowledgeable and affable guides have taken tourists and book-lovers alike through the home and garden, which is still furnished much as it was when the Hemingways lived there. Of particular note are the cats that live on the property; there are over 50 of them, all well fed and well looked after. Descended from a six-toed cat given to Hemingway by a sea captain, about half of them have six toes on their front paws. Hemingway had a writing studio on the second floor of a carriage house behind the main house. The studio overlooked the pool. Kids, this is a typewriter. It’s what people used to type with before there were computers. Although the gate is left wide open, none of the cats on the Hemingway property ever wander off. In fact, the museum staff has to be vigilant to keep the neighbourhood cats from moving in. They say Key West is “New Orleans meets the Caribbean.” I have yet to travel to the Caribbean, so I can’t fully speak to that comparison, but I was definitely reminded of New Orleans’ French Quarter when I finally reached Key West at the terminus of the Overseas Highway. And everywhere you go in Key West, you’re constantly reminded that you’re at the southernmost point of continental USA ― which puts you closer to Havana than Miami. The great thing about Key West is how walkable it is. If you go along Duval Street ― the Old Town’s main drag ― you can literally (no, really!) walk from the Atlantic Ocean to the Gulf of Mexico in half an hour. Duval is the part of Key West that made me think I was in New Orleans, and happy hour is when the party most decidedly gets going. At the Gulf-of-Mexico end of Duval Street is Mallory Square, where everyone gathers at sunset. Buskers entertain you while you enjoy your sundowner and watch the cruise ships leave port. The other great thing about Key West is that when you tire of the crowds of people, all you have to do walk over a block or two, and all becomes quiet. You have only the chickens that roam the streets of Key West for company. There are lots of cute houses. Like this one. … while others could use a bit of paint. … or on one of these. And if you’d rather spend the day at the beach, that’s an option as well. My only regret about my stroll through Key West is that I didn’t have more time. As I drove away, the sunset in my rear view mirror caught my eye. I pulled over to soak in a few more minutes of the Key West vibe, and then, reluctantly, got back in my rental car and drove away. Like most kids who grow up on this continent, my first travel adventures were road trips with my family during the summer holidays. Now, as an adult, road trips have become few and far between. So, for that reason, I was excited to include a coast-to-coast road trip on my recent visit to Florida. Coast to coast? Yup. That would be from the Gulf Coast to the Atlantic Ocean. Now, there are two ways to get from Tampa (on the Gulf Coast) to Miami (on the Atlantic Ocean). The quick and fast way is over the interstate (I-75). There’s also the more scenic route: the Tamiami Trail (that’s Tampa → Miami). Guess which route I took? The Tamiami Trail cuts right through the middle of the Everglades. My intent was to stop here and there and do a bit of looking around, maybe take a walk or short hike through the swamp. It didn’t happen. Because it rained. A lot. All the way from Fort Myers to Homestead, in fact. So instead I saw a lot of this. And my motivation to stop and get out of my rental car and do some exploring dwindled the farther I got from Tampa and the closer I got to the Florida Keys. What I did do was make a mental note to one day come back with my tent and sleeping bag and leave myself enough time to stop over for a couple of nights. Camping in a swamp ― how cool would that be? I was impressed enough with what I did manage to see between swipes of my windshield wipers to know I would enjoy a closer look at the United States’ largest subtropical wilderness. Enough about what I didn’t see in the Everglades. I am happy to report that the weather cooperated once I got into the Florida Keys. The sun shone for the entire drive and the temperature hovered around 80°F for my entire visit. As evidenced by the next photo. The Florida Keys is an archipelago of more than 1700 islands (called “keys”) strung like a broken string of pearls below the Florida peninsula. Forty three of the keys are connected by the Overseas Highway No. 1 ― a 200-km length of roads and causeways stitched together by bridges. A lot of bridges. A lot of long bridges. This one here is called the Seven-Mile Bridge. I learned that it’s exactly seven miles long by carefully watching my odometer. Every key has a name. Some are well known (Key Largo, Key West), some are pretty original (Teatable Key, Bahia Honda Key, Sugarloaf Key), and some, well, it seems like they ran out of inspiration (No Name Key). The keys vary in size and development. The bigger ones are lined with roadside diners, restaurants, and motels, and the odd strip mall; the lack of big box stores and fast food chains made it feel like I had stepped back in time about 40 years. Other keys are so small they have only a few houses, and no commercial development at all. The smallest keys are completely undeveloped. As you drive along the Overseas Highway, you are never far from the water. In addition to the street address, directions are given as “Mile Marker [fill in a number],” Bayside or Oceanside (with Key West being Mile 0). So, MM 59 Bayside faces Florida Bay, and MM 73 Oceanside faces the Atlantic Ocean. Nifty, huh? The Florida Keys is known as a destination for fishing, snorkeling, and diving ― none of which I do ― but if you are looking for an idea for your next road trip, I can highly recommend a drive along the Overseas Highway. As road trips go, it’s pretty spectacular. Wanna know the No. 1 question I’ve been asked about my trip to Florida? Why, yes, yes I did. Although they are not nearly as photogenic as my feathered friends, I found Florida’s reptiles equally fascinating. I suppose the simple reason for that is because native reptiles are few and far between in my neck of the woods. We do have snakes in Canada. And I saw a snake or two in Florida, which I found somewhat interesting. But we don’t have geckos, which I found adorable. And we don’t have iguanas, which I found mesmerizing. Here’s what one of those logs looks like up close. What I really don’t get is why people would want to canoe right up to one of those floating logs. I suppose it’s no different than me sleeping in a tent in the middle of the Rockies knowing full well that bears tend to wander around campsites just before dawn. Sleeping with bears? Canoeing with alligators? I’ll take my chances with the bears, thank you. Who knew there were so many different kinds of birds in Florida? Well, that’s a silly statement, isn’t it? I’m sure a lot of people did ― just not me. I learned a lot while I was in Florida by hanging out with some avid birders, and, with their help, I was able to spot 35 different species during my two weeks in the Sunshine State. As I was ticked each species off my list, my photographer gene went into overdrive. And so, here are one or two photos to share with you. First up are the shore birds I told you last post were so much fun to play with on the beach. The first ones I met were Willets. … and this one is a Sanderling. Sanderlings are tricky to photograph because they zip around at warp speed. Not to mention they blend pretty well into the background. The Royal Terns were my favourite of the terns. Here’s a bunch of them in formation: heads turned away from the wind and beaks tucked into their wings. This one’s a Least Sandwich Tern, which is smaller than the Royal. … and a whole flock of Black Skimmers. … and a whole row of Laughing Gulls preening themselves on a fence. … and here is a female. This Snowy Egret was kind enough to strike a pose for me. The White Ibis (left) is being stalked by a Great Egret (right). Here’s a better photo of the White Ibis. These are Roseate Spoonbills. Apparently they aren’t so common and we were lucky to see them. If you look carefully at the beak of the second bird from the right, you can make out its spoon shape. This bald-headed fellow is a Wood Stork ― the only stork that breeds in North America. … and here’s one showing off. Anhingas stretch out their wings like this to dry off the feathers. These are two juvenile Anhingas. I don’t think a day went by during my time in Florida when we didn’t see vultures circling high above us. This Black Vulture is almost hidden by all the Spanish moss in the tree. Another frequently sighted bird is the Brown Pelican. … and a Florida Scrub-Jay. This Red-winged Blackbird kept me company one morning in the Keys while I ate my lunch. And I met this handsome fellow on one of my strolls through Key West. Chickens are everywhere in that town ― and I mean everywhere. I am sure I goofed up some of the identifications, so do let me know if I did. And, as if I need another reason to travel, I am now thinking that choosing destinations based on their potential for birdspotting is not a bad idea. Not at all.